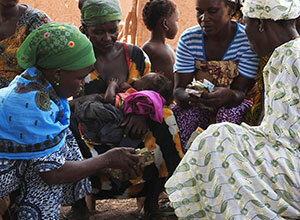 Does Increased Income Within Rural Households Lead To Improved Nutrition? Feed the Future, the U.S Government’s food security initiative, aims for two high-level goals: increasing agricultural productivity and improving maternal and child nutrition. Evidence shows that at the population level, nutrition indicators are positively associated with household income, and since agriculture is the major livelihood for the majority of rural households in Feed the Future focus countries, it is critical to leverage agriculture to support better nutrition. This webinar explored one key agriculture-to-nutrition pathway, which shows the connection between income earned from agriculture and improved nutrition through purchase of food and non-food items. We discussed the importance of income to nutrition, reviewed the existing evidence, and shared programmatic experience with achieving nutrition gains through the income pathway. First, SPRING presented preliminary findings from a literature review on the relationship between rural household income and nutrition and a technical guidance brief prepared for USAID that proposes several key points that highlights income’s positive influence on nutrition. Then, FINTRAC provided a realistic view of the various challenges associated with making income work for nutrition based on its work in two countries.